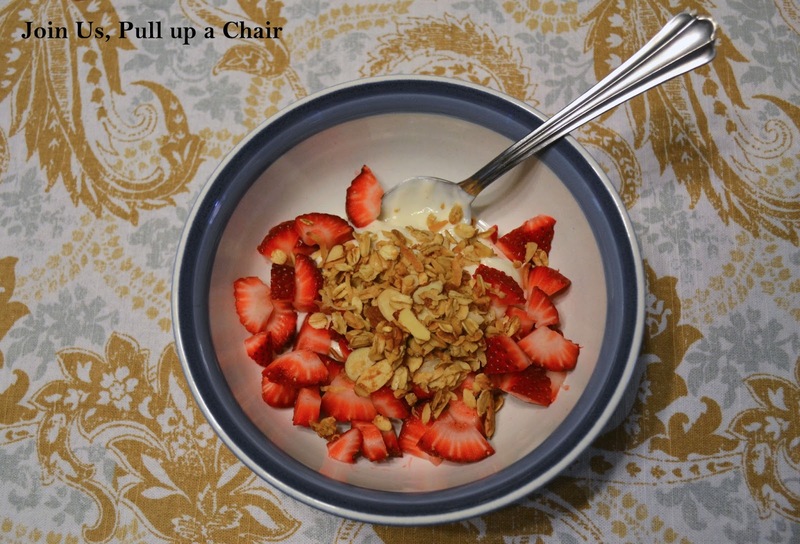 We all love granola and I found it’s a great way to get Madeline to eat yogurt. She’s now telling me things that she loved to eat, she doesn’t like anymore. Oh dear child! She’s definitely keeping me on my toes. She loves to have a little treat after dinner and I feel so much better about her eating some vanilla Greek yogurt with some of this granola on top. She’s now asking for it for breakfast in the mornings! I love how tropical this granola is and it’s from the coconut and coconut oil. This was my first time cooking with coconut oil and I’m looking for new recipes to incorporate it into. If you have any favorites, let me know! I want to experiment more! Preheat oven to 300 degrees. Line a large baking sheet with parchment paper and set aside. In a small sauce pan, melt the coconut oil. Stir in the honey and mix together until combined. Remove from heat to cool slightly. Add in the vanilla. In a large bowl, combine the oats, almonds and coconut. Once the honey and coconut oil are melted together, add the dry ingredients. Mix well. Spread the granola on the prepared baking sheet and bake for 15 minutes. Stir and bake for 10 more minutes. Stir and bake for 5 minutes until golden brown. Once the granola has cooled, add any dried fruit or chocolate chips to the mixtures. I really need to make my own granola. You've inspired me. Great SRC Choice. I make a very similar version, except mine also has cinnamon and a little salt. I also add some chopped walnuts sometimes. LOVE this granola…I eat it several times a week!